In the last decade, the sport of eventing has changed drastically. As a result, the modern day event horse has also changed. We've seen breeders increase the amount of warmblood in the event horse, but we've also seen the struggle to get these types of horses competing in the three and four star level and be competitive world wide. 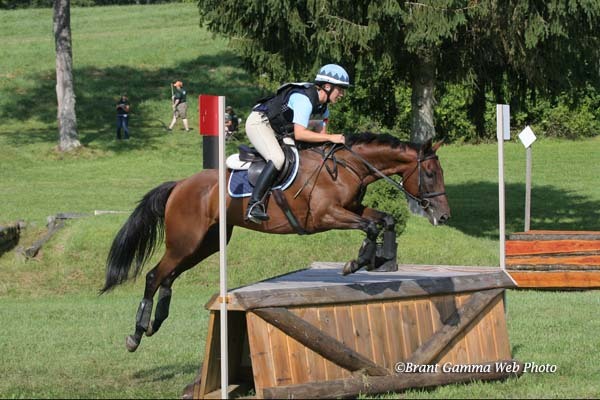 While these warmblood horses have the movement and the jump, many do not have the stamina for the cross country, even in its shortened format. At the same time, we've seen more money come to the sport, and with this money more and more people going to Europe to look for their upper level horses. There is a need for US bred upper level event horses. Of the top finishing horses in the last World Equestrian Games, only three have less than sixty percent thoroughbred.1 Similar is true of the top horses in other high profile events throughout the world. We believe that the right horse is combination of warmblood and thoroughbred, power and stamina, movement, gallop, jump, and work ethic. We've selected three foundation broodmares to start our program. All come from strong thoroughbred racing lines. While we are not in the business of racing, we believe that a strong gallop is important for the modern event horse because you run and jump from the gallop. Furthermore, we can all appreciate a great athlete. It is not a surprise that these great racehorses share common ancestry with some of the most successful international event horses competing at the highest levels. The stallions are picked to compliment our mares based on their confirmation, pedigree, temperament, and performance. We look for registered warm bloods with some thoroughbred lineage so that our babies maintain a large amount of 'blood'. We are really looking forward to the exciting young horses to come. Mollie is by Global Mission (Danzig) out of Knight Mistress (Deputy Minister). Mollie's father was unraced, but Danzig ran three races and won all of them; he also topped the leading thoroughbred sire list from 1991 to 1993. Likewise, Mollie's maternal grandfather, Deputy Minister, was the leading thoroughbred sire in 1997 and 1998. It is not surprising that a stallion who produced so many successful race horses also produced successful event horses. For example, William Fox Pit's horse Bay My Hero, winner of 2014 Rolex CCI4 and fourth place finisher at Burghley CCI4 the same year, has Deputy Minister three generations back. Mollie is a striking mare worthy of her lineage. She has big movement, an uphill build, good feet, good bone, and a stellar temperament. We feel fortunate to have found her for our breeding program. Our only regret it that we did not find her while she young enough to bring along as a competition horse for ourselves. Aly is by Aly Rat (Alydar) out of Texas Two Step (Track Dance). She was purpose bred for eventing in New Mexico at Goose Downs Farm by Tom and Jaffray Riding. Alydar is a horse we are very happy to represent in our foundation because he is known to produce a spectacular jump. We see this trait in horses like Jock Paget's Clifton Promise, 2014 Badminton CCI4 winner and runner up at Burghley CCI4 as well as Pau CCI4. Aly's mother's lines got back to Nijinksy/Northern Dancer, Bold Ruler, and Buckpasser. All of these horses are found in numerous upper level horses; of the 13 full thoroughbred competing in the 2014 Rolex CCI4, these lines are found in 12. Aly is a phenomenal athlete. She has three well balanced, graceful gates, incredible scope, and quick, agile reflexes, which means you cannot get her into trouble over fences. Aly successfully competed through the training level before being bred. She is currently in foal to the 2004 Holsteiner stallion Quite Easy. Esther is a 2005 Thoroughbred mare by Five Star Day (Carson City) out of Lark in the Meadow (Greinton(GB)). She is a very special mare to us because she is a half sister to our own L.E. Font and Tenure Track. We sought a mare by Five Star Day after owning these two talented geldings. Five Star Day's lineage goes back to Mr Prospector and Vice Regent both of whom feature in Becky Holder's four star horse Courageous Comet. Esther's mother's sire won nearly two million dollars in 22 starts; her lineage also traces back to Nijinksy, TV Lark, and Nasrullah, all of which are prominent sport horse lines. Esther raced until she was 9 years old, accumulating 48 stars and a number of wins. This is a testament to her own soundness and work ethic. We are fortunate to have found her especially since hearing Five Star Day passed away in 2014.